Casual dining in a rustic atmosphere has made The Country House Restaurants a west suburban favorite for more than 40 years. We are a great spot for a quick business lunch, a relaxed dinner, or just to have a cocktail with your neighbor. 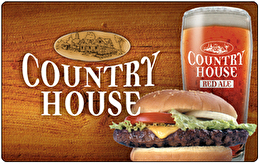 We are best known for our highly recommended "Country Burger" a hearty half pound served on dark rye. It was recently voted "Chicago's Favorite Burger" by the readers of The Chicago Tribune. In addition our menu also features hickory smoked ribs, char-broiled steaks, fresh salads, pastas, and daily specials - all in a friendly neighborhood setting. There is also a full service bar where you can enjoy your favorite beer, a martini, or a glass of wine by the fireplace. We are open 7 days a week for lunch, dinner, or a late night meal. For balance inquiries call the phone number to a Country House Restaurant's location below.